Hidden away in the south-west of France, there is a very small village, and in that village there is an eighty-five year old farmer who stands alone in his welding shop, skillfully creating his artwork. His shop is a very small hanger provided by the Mairie or town hall located on the main road which leads to the Atlantic Ocean. On a bright sunny day the artist puts on his blue coveralls and walks the short distance from his apartment to the hanger to weld. 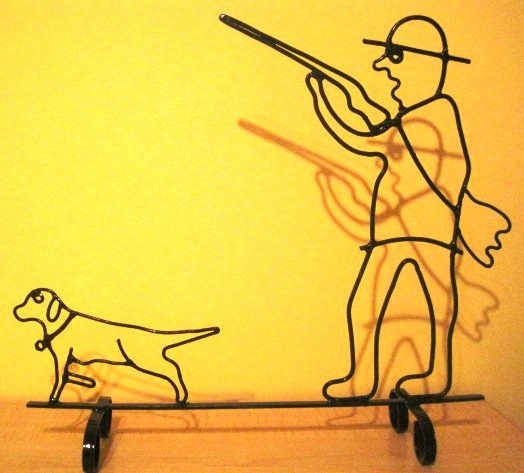 He does not just work with metal; he creates art using templates that are hand drawn by his eldest son. His artwork tells a story about French hunters, it is a collection of stories and now very much part of my family heritage as two of his pieces sit in his great grandson’s room. Hunting and trapping is almost part of everyone’s heritage and its legacy along with our family history is kept alive through stories, and art such as paintings, songs and historical pieces such literature, paintings in caves, clothing, jewelry and various other forms. Each piece has its own story as it is passed along through the generations and yet even today we are trying to put together the facts and ultimately find the truth, so that we may share the stories as accurately as possible with our future generations. It is now, as it has always been a time to collect family stories and artifacts which keep our hunting tradition alive. But it is not just about tradition it also binds the family link and gives it substance, richness in sort. 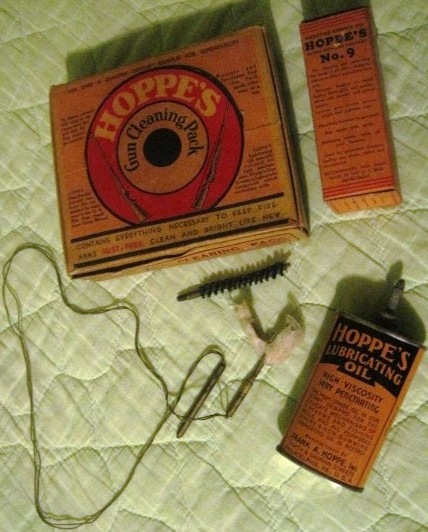 A few weeks ago, I came home from a hunt and was putting away my gear and cleaning my Remington 870, and so I opened my drawer where my cleaning kits were stowed away and there I found my great uncles Vintage Hoppe’s #9 cleaning kit. It still had the cleaning swab in the adapter which was attached to the bore snake cleaner that is pulled through the barrel in order to clean the rifling. Although I used my more recent cleaning kit, I stopped and took time to appreciate the piece of family history that I had inherited, and thought about the hours spent cleaning his rifles after being out for a few days at the camp near the hunting grounds. The smell of the lubricating oil opened a vault of emotions and memories. With a successful hunt now behind him, he could now rest and take shelter in the warmth of his workshop at his home, light up a cigarette and clean his rifle which he treated with care and respect. I often turn on the radio and listen to some classics like A White Sport Coat and a Pink Carnation by Marty Robbins, while I unpack and clean up my kit for the next outing and I take great pride in cleaning the firearms that were passed down through the family as I am sure my great-uncle did too after the war. A tradition has been born. Next time you are in the attic; at your family’s farm, or visiting great uncles. Ask permission, ensure it is safe to handle and pick up a piece of family history and collect its story, so that future generations in your family may savor the piece of their history. There will come a time when it is our turn to go and maybe one day a young person will find a spent shotgun shell carefully place in a jar with a feather and wonder what this all means. Little does he know that it was a souvenir of one of his grandfather’s first turkey hunt and that on that day his wife; your grandmother made his favorite sandwich along with a box of raisins just the way he loved it and your family had a wonderful feast that spring. Collect it before it collects dust first!